This new 2019 Yamaha Kodiak 450 ATV for sale has 0 miles. The color is Fall Beige with Realtree Edge. It is offered for sale by Unlimited Cycle Center and located in Tyrone, PA. The listing # is 43435. The average price of a 2019 ATV for sale is $12780.95. This model is priced $7281.95 less. The average price of a 2019 Yamaha ATV for sale is $8980.79. This model is priced $3481.79 less. There are 285 Yamaha ATVs for sale within 150 miles of Tyrone, PA. If you looked at the average 2018 Yamaha ATV for sale it would cost $4141.10 more. The average price of a 2019 Yamaha Kodiak 450 ATV for sale is $5926.24. This model is priced $427.24 less. 9. 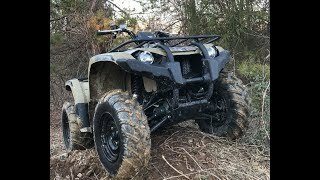 Lake Houser ATV park 2018 Yamaha Kodiak 450 and more!! !